"The fundamental aspect of video is not the image, even though you can stand in amazement at what can be done electronically, how images can be manipulated and the really extraordinary creative possibilities. For me the essential basis of video is the movement - something that exists at the moment and changes in the next moment." Video became an excitingly immediate medium for artists after its introduction in the early 1960s. The expensive technology, which had been available prior only within the corporate broadcasting arena, experienced an advent when Sony first created an economical consumer piece of equipment that allowed everyday people access to vast new possibilities in documentation. Understandably, this produced huge interest for the more experimental artists of the time, especially those involved with concurrent movements in Conceptual art, Performance and experimental film. It provided a cheap way of recording and representation through a dynamic new avenue, shattering an art world where forms such as painting, photography, and sculpture had been the long-held norm. This expanded the potential of individual creative voice and challenged artists to stretch toward new plateaus in their careers. It has also birthed an unmistakable population of artists who may never have entered the fine art field if stifled by the constraints of utilizing traditional mediums. With warp speed over the last half century, video has become accessible by the populous, spawning a continual evolution of its use; we live in an age where even your everyday smartphone has the ability to create high caliber works of art through the use of an ever increasing assortment of applications. We now consider Video art to be a valid means of artistic creation with its own set of conventions and history. Taking a variety of forms - from gallery installations and sculptures that incorporate television sets, projectors, or computer peripherals to recordings of performance art to works created specifically to be encountered via distribution on tape, DVD or digital file - video is now considered in rank equal to other mediums. It is considered a genre rather than a movement in the traditional sense and is not to be confused with theatrical cinema, or artists' (or experimental) film. Although the mediums may sometimes appear interchangeable, their different origins cause art historians to consider them distinct from each other. So popular a medium, many art schools now offer video as a specialized art major. With the introduction of the television set in the second half of the 20th century, people gained a new all-consuming pastime. Many artists of the era used video to make works that highlighted what they saw as TV's encroaching and progressively insidious power by producing parodies of advertising and television programs. They pointed provocative fingers at the way society had become (passively) entranced with television or had succumbed to its seductive illusions. By co-opting the technologies of this medium, artists brought their own perspectives to the table, rounding out the brave new world of broadcasting ability to include creative, idiosyncratic, and individualized contributions. Some artists have used video to make us think more critically about, and oftentimes look to dissect, Hollywood film conventions. By eschewing the typical templates of formulaic narration, or by presenting intensely personal and taboo subjects on screen as works of art, or by jostling our ideas about how a film should look and feel, these artists use the canvas borrowed from the cinema to eradicate preconceived ideas of what is suitable, palatable, or focus-group-friendly. Looking beyond video's recording capabilities, many artists use it as a medium for its intrinsic properties with work that mimics more traditional forms of art like painting, sculpture, collage, or abstraction. This might emerge as a series of blurred, spliced scenes composed as a visual image. It may take the shape of a recording of performance meant as a reflection on movement or the perception of space. It may consist of actual video equipment and its output as objects in a work. Finally, it may be a work that could not exist without the video component such as art pieces that utilize video signals, distortion and dissonance, or other audiovisual manipulations. Because Video art was radically new for its time, some artists who were trying to push limits in contemporary society felt video an ideal format for their own work. This can be seen in the Feminist art movement in which many women, who hoped to distance and distinguish themselves from their male artist forebears, chose the medium for its newness, its sense of progression, and its opportunities that had not been widely tapped or established yet. We saw this politically, too, as many artists with a cause began using video as a means to spread their message. It appeared socially as well, as many people working to expose or spread important, underexposed information, felt the medium was conducive to both grass roots affordability and yet very broad distribution capabilities. Although artists have been creating moving images in some form since the early-20th century, the first works to be widely labeled as 'Video art' are from the 1960s. The first nationalities to pick up on the Portapak as an artistic tool - and therefore those who made the earliest pieces of Video art - were, unsurprisingly, from those countries where it first became commercially available (the US and the UK were the early practitioners). For Sun In Your Head - Television Décollage, German artist Wolf Vostell distorted and played with various single frames that he'd sourced from film and television of the time (such as a smiling woman; words such as "Silence Please! Genius At Work!" or an embracing couple, for example). The resulting piece is a fast-paced, flickering mish-mash of televisual images that veer from flashing, abstracted shapes to recognizable forms. The work was shown as part of Vostell's nine-part 'happening' - 9 Decollagen - which took place in Wuppertal, Germany in 1963. As no video playback technology was available at the time, Vostell recorded the images from a television set using a film camera, allowing him to edit the piece and play it back on a projector. With its highly experimental technique and subversive form, Sun In Your Head was one of the first works to examine the possibilities of television as a medium in its own right. It employs his innovative use of the decollage technique, first associated with the French Nouveau Realisme movement who used the term to describe their ripping, erasing, and reworking of Parisian posters to create new information. Vostell used it to refer to the re-mixing and layering of image and sound he employed to create a new artistic language in his Video art. A pioneer of the European branches of the Fluxus and Happening movements, Vostell is considered one of the most influential early Video artists - he was also the first to use a television as an object in an artwork in 1958. In Sleep, Andy Warhol filmed his close friend and occasional lover John Giorno sleeping for five hours and twenty minutes. The piece's length means few people have watched it from beginning to end (two of the nine people who attended its premiere at The Gramercy Theater in New York left during its opening hour), and it is considered one of the first and most important works of durational art. Sleep looks at themes of intimacy, repetition, and duration, and is one of the first examples of what Warhol called his 'anti-films', in which he used hugely long, single takes to record his everyday experience and that of his friends. Although Sleep is a film rather than a video, Warhol's use of the camera, in which he just switched it on and walked away, make it stylistically much closer to art then film since he is clearly looking to bash Hollywood's conventions of narrative and the strategic manipulation of real time through editing. The artist's use of such epic duration has been exceptionally influential, inspiring many contemporary film and video artists working today. Sam Taylor-Wood's hour-long film of David Beckham sleeping in 2004 directly referenced Warhol's piece. Christian Marclay's 24 hour-long epic Clock and Douglas Gordon's slowed version of Alfred Hitchcock's masterpiece, 24 Hour Psycho, were also made in the same tradition. Fluxus artist Nam June Pak was one of the first artists to break the barriers between art and technology. 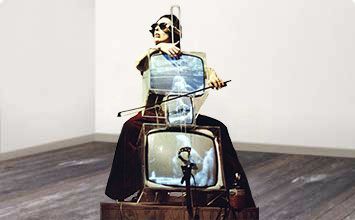 TV Cello is a seminal example, specifically created for use in performance by the avant-garde cellist Charlotte Moorman. The work consisted of three television sets piled on top of each other, all showing different moving images - a film of Moorman performing live, a collaged video of other cellists and an intercepted broadcast feed. Ingeniously, the whole sculpture was also a fully operational cello, designed to be played with a bow to create a series of raw, electronic notes that reverberated through the space. By appropriating the domestic television set as an art object in this way, Paik became one of the first artists to establish video as a serious artistic medium. By taking the television out of its normal setting and using it in such subversive performances, he wanted to question its increasingly dominant role in shaping public opinion. Art Make-Up consists of a series of four films set in Nauman's studio in which the artist slowly and ritualistically applies individual layers of color - white in the first, then pink, green and finally black - to his naked torso. The title refers simultaneously to the substance the artist is using, to the idea that he is "making himself up" for the viewer, and to the question "What is an artist made of?". Nauman was exploring the boundaries between disguise, masquerade, and reality by presenting these four versions of himself, none of which can be said to be the 'real' Bruce Nauman. Each ten-minute section was originally intended to show on four separate screens on the walls of one square room, with the viewer never witnessing the artist without a colored mask. Bruce Nauman was one of the first video artists to work with the single take, fixed-camera technique that's demonstrated in Art Make-Up - a method in which the scene is shot from one perspective in one sitting. This created a sense of authenticity to the work, which, in its refusal of editing or fluctuating shots, allowed for a denial of the normal cinematic fluff-and-preen convention, an important distinction to many of these artists. These artists looked to the new medium to document and extend ideas around live performance - an approach that would influence generations of artists, including the so-called 'father of Chinese Video art' Zhang Peili and contemporary US conceptual artist Martine Syms. Along with his groundbreaking use of video to push the possibilities of art making to new limits, the work is also a prime example of Nauman's use of his own body as a tool for artistic exploration. In Facing A Family, Austrian feminist performance artist Valie Export filmed a family watching the camera as if it was a television set in their living room. Labeled a 'TV action' by the artist, the footage lasts for almost five minutes, during which time the viewer becomes more aware of the piece's mirror-like quality and the passing of time - it is as if the viewer and the family are gazing at each other. The work was originally broadcast on Austrian television in 1971, ironically viewed by a large portion of the country's TV-consuming families. Export wanted viewers to reflect on the passive role they took on while being entertained, and to think about how we construe the contents of our television screen (fantasy versus reality). It was considered especially pioneering at the time, produced just as TV was becoming ever more dominant in lives of the public and concerns were being voiced about its increasing power. Named after a type of television malfunction, Vertical Roll is a disrupted recording of Joan Jonas rehearsing for a performance in her studio as her masked alter ego, Organic Honey. As the image on the screen constantly rolls to a steady rhythm (which Jonas/Honey taps out, first with a spoon then a length of wood), we see various parts of the performer's body - her masked face; her wheeling legs; her rotating, corset-clad torso; and a shadow of her hand holding the spoon. All are shot from a dizzying variety of angles, abstracting many of the body parts so they appear strange and unfamiliar. Jonas also plays with and moves around the video's frame throughout the piece, highlighting the difference between her live activity and its videoed portrayal. Vertical Roll is a prime example of Jonas's seminal video works of the 1970s that theatrically explored ideas of female identity. She often used her alter ego to investigate notions of masquerade and femininity, producing an elusive and disjointed self-portrait using what was, in the 1970s, a new and cutting-edge medium. She is considered a key figure in the history of both Performance and Video art, and has been enormously influential on many contemporary artists who use their bodies in performance to explore what it is to be female today, including Video artists Sarah Lasley and Amber Hawk Swanson. Conceptual art pioneer John Baldessari made Teaching A Plant The Alphabet in direct response to Fluxus artist Joseph Beuys's innovative 1965 performance How To Explain Pictures To A Dead Hare. Described by Baldessari as "a perverse exercise in futility", the Portapak video consists of the artist's hand showing educational flashcards of the alphabet to a clearly unresponsive potted plant, repeating each letter slowly and deliberately, as if tutoring a small child. Like much of his work, the piece is full of irony and subtle humor, using everyday objects and a seemingly mundane task to explore broader philosophical concerns. In this case, those concerns are structuralist theories of the 1970s that presented language as a series of signs. Baldessari was also influenced by books published by members of the hippie movement, which encouraged people to communicate with their plants. Teaching A Plant The Alphabet is one of the best-known examples of Baldessari's artistic exploration of ideas around language, dealt with using his characteristic sense of humor and offering a fresh, original perspective on what he called the 'pedantic' and uncompromisingly serious conceptual art of the day. The use of video allowed him to further his already quite established conceptual agenda by utilizing a brave new form to expand his ideas from a static space to a live one. In Semiotics of the Kitchen the artist walks into a kitchen, dons an apron, and proceeds to vocally identify kitchen objects in alphabetical order: a for apron, b for bowl, c for chopper, d for dish, etc. As she goes down the roster, she quickly demonstrates each object's use. For the last few letters u through z she simply makes the shape of the letter with broad sweeping gestures of her arms while holding a utensil in each hand. There is a violent force in the manner in which Rosler presents many of the objects, such as slamming down the meat tenderizer or jabbing violently with the ice pick, which contradicts society's image of the happy homemaker in a decidedly passive-aggressive fashion. This work is an important example of how early Feminist artists co-opted the video medium to establish themselves as important new voices disembodied from the male art canon and its many years of more traditional artwork. The first in a series of tapes with the same name, The Reflecting Pool shows a man (Viola) approaching an artificial pool in the middle of a dense forest. As we hear trees rustling, water flowing and an airplane flying overhead, the man leaps into the air as if to jump into the pool, then remains frozen in mid-air, his image gradually fading into the foliage behind him. Eventually, he emerges from the pool as if reborn - Viola has said that he was portraying "the emergence of the individual into the natural world, a kind of baptism." He also used a simple masking effect to split the frame so that the human action above the water wasn't always reflected in it, turning the pool into a metaphor for the mystic and separating its strange world from the real one in the other half of the screen, while ensuring they remained united by the televisual frame. This work marks the beginning of Viola's innovative use of special effects to explore notions of transcendence and spirituality. He wanted to use a medium that had previously been regarded as embodying the literal to explore invisible phenomena and examine the gap between the seen and the unseen. In subject as well as technique, Viola is seen as one of the most important artists working in video from the 1970s to the present day. His works have proved hugely influential on other, younger artists working in epic and immersive film and video such as Cremaster Cycle creator Matthew Barney, and Swiss video installation artist Pipilotti Rist. In Why Do Things Get In A Muddle, Gary Hill constructs his own, twisted version of the classic literary nonsense story Alice In Wonderland. Hill had become fascinated with the concept of entropy - a term that refers to gradual descent into disorder - and wanted to explore it using video and sound. Most of the piece was performed and recorded backwards, including the exchange between the two characters (a childish woman called Cathy and her father), before being reversed again in the editing process. Their resulting confusing conversation about confusion itself was inspired by theoretician Gregory Bateson's definition of a 'metalogue', as quoted in the work's opening sequence: "When a conversation between people mirrors the problems themselves." At thirty minutes long, this was the first video piece for which Hill wrote a full screenplay. Why Do Things Get In A Muddle was considered groundbreaking in its open, experimental approach to movement, sound and words, as well as the artist's inventive use of editing techniques to make a conceptual point. Contemporary artists who stretch the medium in similarly innovative ways include British artist Ed Atkins, who uses moving image, bodies and text in his subversive video installations. The work of US multimedia artist Adam Pendleton engages with language and meaning in ways that also owe a clear debt to Hill.